Lacked a little flavour compared to an authentic made chicken curry. Probably just me but I found myself hungry after as I struggle to stick with correct portion size. WW Bowl Chicken Curry is a handy meal to grab out of the freezer and both my husband and I enjoy them. I prefer it to be a bit stronger in flavour though and sometimes need to add some chilli. The WW Thai Chicken Curry is hard to find as not all supermarkets stock it. More accessible and bette Ethan this in my opinion is the mango coconut variety. It is really healthly and great for your body. It has everything that a person would need to look after themselves. I would really recommend it to any person who wishes to eat healthy. Weight Watchers chicken thai curry is a small serving of curry that is only good for a lunch meal not dinner,it is okay but nothing special. I enjoyed the Weight Watchers Bowl Chicken Thai Curry, the veggies were fresh and chicken and rice cooked perfectly. My only complaint is I had to add salt for more flavour. Easy to heat and you can always rely on weight watchers to deliver quality, perfect for time poor mums looking for something quick to satisfy and still be healthy(ish). Can be a bit expensive but are often on sale. I love all off Weight Watchers meals I have never had a unhappy meal. The taste of everyone is perfect. Taste quantity and quality is perfect. 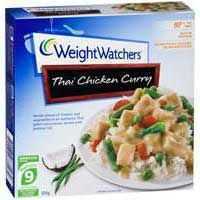 How would you rate Weight Watchers Bowl Chicken Thai Curry?